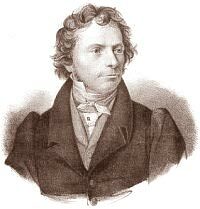 German naturalist and biologist. Professor in Jena (1807), editor of the journal Isis from 1816, he was then a professor in Munich (1827-32) and in Zurich. Bibliography: E. Kuhn-Schnyder, Lorenz Oken (1779-1851), Zürich, Rohr 1980; M. Ruch, Lorenz Oken (1779-1851). Ein Lesebuch, Offenburg, Reiff 2001; O. Breidbach (hrsg. ), Lorenz Oken (1779-1851). Einpolitischer Naturphiloosoph, Weimar, Böhlaus 2001. Catalog der Bibliothek von Laurentius Oken, Zürich, Ulrich 1852, 206 p.
The sale catalogue, drawn up at Oken’s death, lists 5,881 bibliographic descriptions. The subdivision by topics follows the classification of the "system of the sciences" of the time.